On the same day a Canadian Islamic group warned that reprinting cartoons of Muhammad could endanger Canadian troops overseas, Prime Minister Stephen Harper said he regretted their publication. "Free speech is a right that all Canadians enjoy; Canadians also have the right to voice their opinion on the free speech of others," Harper said in a statement, his first comments on the controversy. 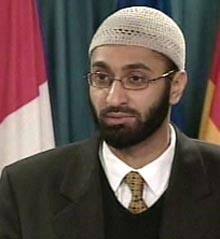 Riad Saloojee, executive director of the Canadian Council on American-Islamic Relations. "I regret the publication of this material in several media outlets. While we understand this issue is divisive, our government wishes that people be respectful of the beliefs of others. I commend the Canadian Muslim community for voicing its opinion peacefully, respectfully and democratically." Harper's comments come as the Canadian Council on American-Islamic Relations held a news conference in Ottawa a day after the Western Standard magazine reprinted some of the cartoons. At least three other Canadian publications had already printed one or more of the cartoons. "I think the fact that people choose to reprint the cartoons could put our troops in danger," said council spokesperson Riad Saloojee. "That's, I think, one of the reasons why major [Canadian] media outlets have been responsible and chosen not to do that." More than 1,500 Canadians are serving in Afghanistan, a number that will grow to more than 2,200 within weeks. Eight Canadians have been killed while serving in the war-torn country in the past four years. The publication of Danish cartoons depicting the Prophet Muhammad set off violent protests and riots in some Middle Eastern countries as some Muslims consider any image of the Prophet blasphemous. As many as 10 people were killed in Afghanistan during violence related to the caricatures. The council on Tuesday launched an educational campaign on the life of Muhammad and Islam, called "Explore the Life of Muhammad." Council members are calling on mosques around the country to hold open houses for non-Muslims.